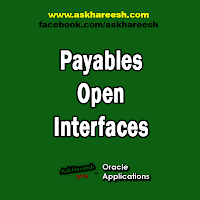 Payables Open Interface : Payables open interface is an interface provided by oracle to import invoices into the system using various sources such as Auto invoice process, EDI ecommerece gateway, invoices from credit card and procurement card transactions and invoices from external systems. You can load standard invoices as well as credit memos using the Payables Invoice Open Interface. Once the invoices are loaded into the system, Payables Import program can be run to import the invoices into Oracle. Payables PCard Open Interface : Some business can streamline the procure thopay process by using procurement cards. Employees can purchase the required items using credit cards and suppliers can send the relevant information to the payables interface. The payables invoice import program can be submitted to generate invoices for these transactions..
Payables Credit Card Expenses Businesses use SQL loader scripts to load credit card expenditure related system into the interface tables which can later be imported into the system to create expense reports. Oracle has predefined the Loader Scripts for credit cards like : American Express, Visa etc. Payables Matching Open Interface: Use SQL*Loader to load the required information into the purchasing interface tables. You will need to create a SQL*Loader control file to format the information you want to load. The file you write will vary greatly depending on the nature and format of the flat file you use. You match invoices to purchase order shipments during invoice entry.